When it was originally observed by Joseph Priestly in 1770, EDM Machining was very imprecise and riddled with failures. Commercially developed in the mid 1970s, wire EDM began to be a viable technique that helped shape the metalworking industry we see today. 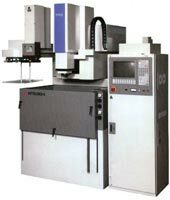 In the mid 1980s, the EDM techniques were transferred to a machine tool. This migration made EDM more widely available and appealing over traditional machining processes. Today, Wire EDM makes it possible to work with harder materials and metals while keeping the exactness of precision cutting.